All About Apricot Kernel Oil! Apricot Kernel Oil is cold expeller pressed and refined from the kernels of the apricot fruit, Prunus armeniaca. 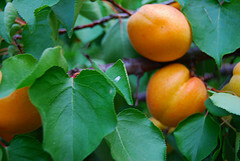 The apricot tree is a member of the rose family originating in Central and East Asia. Apricot, refined, oil is light in texture, pale yellow in color with a nutty scent, similar to sweet almond oil. The organic, unrefined, oil is a darker golden color with a deep richer scent. It's mild, moisturizing and soothing with benefits for the skin, hair and scalp! Apricot Kernel Oil has the benefits of vitamins with a high vitamin A and E content. It is high in essential fatty acids, oleic and linoleic. It penetrates the skin with no oily residue. It's moisturizing, softening and soothing. Skin is soft and supple, with a natural glow. It's mild nature is recommended for dry, irritated, inflamed, mature, acne-prone or sensitive skin. It reduces inflammation and soothes irritation of eczema or dermatitis. It's used as a carrier massage oil, for babies or adults, with aromatherapy benefits. Find it in commercial or homemade soaps, lotions, creams, balms and other cosmetics. Find Apricot Oil in shampoos or conditioners. It adds softness, moisture and shine to hair. It's moisturizing and soothing properties improve irritated or dry scalp conditions. It promotes hair growth! Apricot Oil is easily accessible. Find it in natural or organic food stores, supermarkets, on-line and other locations. It stores well in most locations but not in extreme heat. Extreme heat will shorten its shelf life. The average shelf life is one to three years. Use Apricot Oil in your homemade soap recipes. It's great for superfatting. Try using just one or two ounces, in every pound of fat, at trace. Are you looking for the right soap making oil? Find it now! SOAP MAKING TIP: Combine apricot kernel oil with lavender and tea tree oil, (melaleuca oil), for acne relief. Get rid of blackheads and reduce inflammation of blemishes. Skin is soft and soothed. If using essential oils, remember, they are concentrated oils of a plant. They carry a distinctive fragrance or "essence" from the object from which they were extracted; plant. leaves, flower or peel. They contain bioactive ingredients. This means, they contain natural chemicals that interact with biological systems. they're potent chemicals and should be used with care! Never use large amounts of essential oils, externally or internally. Never use them straight. They must always be diluted in carrier oil, or soap, lotion, or other buffering agent. Finally, never use them without knowing what their bioactive compounds are known to do.